Inner city residential development in Wellington will continue to increase in the immediate and foreseeable future in response to the projected population growth, the shortfall of housing and a desire to live closer to city. What sort of buildings and internal spaces do we want to live in as we increasingly move to medium and high density housing? How do we ensure the developments support the goals of a people-centred city and a dynamic central city? Free RSVP on Eventbrite or Facebook. Working collectively to improve the quality and supply of housing in New Zealand. Our Monthly Committee Meeting. Everyone welcome. Back in 2008 a group of passionate inner city dwellers got together to form the Inner-City Residents and Business Association. 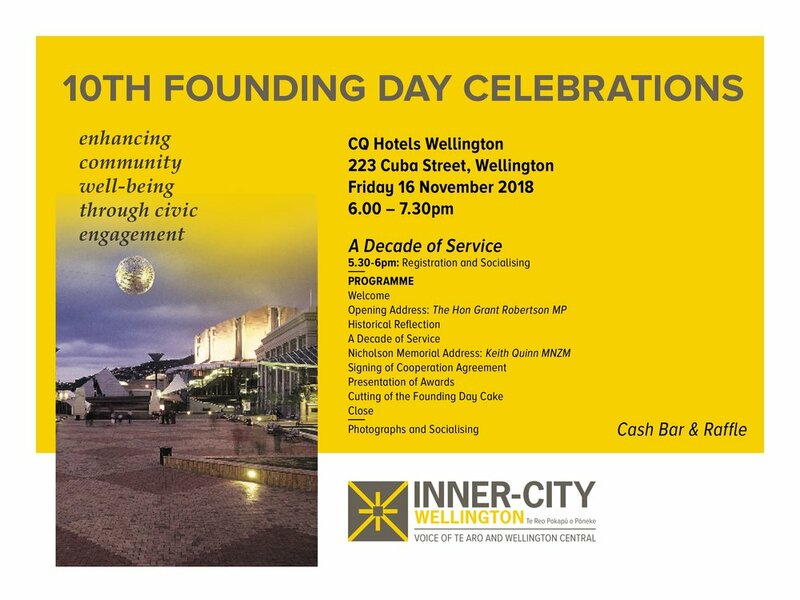 These founding members laid a strong foundation for a community-driven organisation, now known as Inner City Wellington. Now 9 years on we continue to go from strength to strength as the voice of Wellington's inner city. Come and help us celebrate! This is your chance to hear what the parties and the candidates are offering. They will have the chance to tell us what they stand for, answer some specific questions we have formulated and answer questions from the floor. This will be an event you shouldn’t miss. The invitation has been extended to all parties, and if others respond we will update our website. What is being done to stem the housing crisis in Wellington? Wellington's Mayor Justin Lester to discuss a future of safe, affordable homes for everyone. Our Monthly Committee Meting. Everyone welcome. - What is the wider character of Oriental Bay? - What are currently some of the positive things you see in Miramar? - What are the issues currently happening in Miramar? - Safer routes for all types of cyclists/pedestrians? - Something the community is proud of? · More traffic islands/speed restrictions in certain areas? · Continuous, consistent marked cycleway? · How do we cater for people on foot? · How do we cater for people riding bikes? · How do we cater for the buses and passengers? · How do we cater for people driving cars? · How do we cater for trucks/service & delivery vehicles? Please feel free to share this invite with others who may be interested.